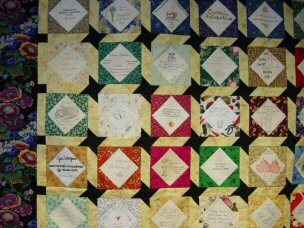 I participated in three dear Jane siggie block swaps in 2005. I swapped blocks with Kalico Janes in St. Louis, Missouri in February. Next, I swapped with my small sewing guild, So Sew Busy Quilt Guild in March. Finally, in April I swapped with the Dear Jane Online List. As I was enjoying my blocks, I couldn't put them down; somehow, I was constantly drawn to the blocks. I alphabetized them by first names so I would be able to find the blocks quickly when participants posted to the online DJ List. That was so much fun as now I could relate to the members posting to the group. Then I shared them with my quilting friends, who also "oohed" and "aahed" over them. I got nervous every time I handed over the blocks to my friends as I did not want them to get out of order. Then, I decided the best way to avoid them getting out of order was to put the top together. Now, how do it set the blocks? I received 157 signature blocks of which three were too small. I decided on an 11 x 14 block setting, using 154 blocks. I'll make a pillow from the 3 remaining blocks. 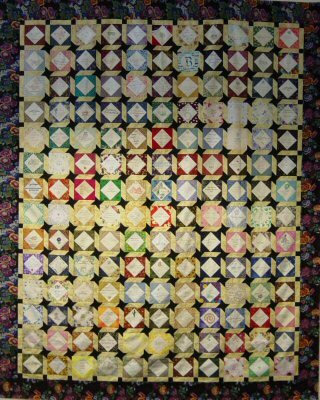 I looked at various siggie quilts, but just couldn't find the setting I wanted. I decided upon adding friendship stars in the sashing as the blocks are actually friendship blocks. Trust me, this task is not for the meek as I ended up adding more pieces to this quilt than in the all the blocks combined. 1,827 pieces; 168 different fabrics (other than unbleached muslin, no fabrics are repeated block to block); started piecing top on 5/8/05; top completed 5/16/05; top completed 11/1/05.